Jon Holmes first started as a Bishop Miege waterboy in fifth grade. He grew up idolizing the Stag program and the players. Holmes graduated from Miege in 2002 and then spent two years playing for Fort Scott Community College before he transferred to Missouri State and eventually suffered injury. In 2004, he returned to Miege and served as an assistant coach for two seasons before Tim Grunhard took over the program. Grunhard, well-known as a former Notre Dame and Kansas City Chiefs offensive lineman, rebuilt the Stag football program. A state championship in ’09 marked Miege’s first appearance in a title game since 1982. From ’06-11, Holmes served on staff, including five seasons as an offensive coordinator. When Grunhard left for the University of Kansas, Holmes, immersed in Miege virtually his whole life, became head coach. Holmes, helped by his assistants and a bevy of top talent, has built the Stags into one of the top-five programs in all classes. Grunhard has since returned to the program as an assistant. Holmes, who considers Grunhard a mentor both as a coach and father, has spoken with many successful Miege coaches, including since-retired volleyball coach Gwenn Pike and girls’ basketball coach Terry English, a duo who has combined for 40 state titles. Holmes, very active on Twitter, has long talked with his program about being role models for youth and community, providing the same leadership he saw from former Stags when he was a kid. A recent social media photo showed Miege standout senior wide receiver Jafar Armstrong, a Missouri commit, signing an autograph for a youth. This season, Miege, the two-time defending Class 4A-I state champions, lost in the season opener, 35-28, to Blue Valley and then ran off 11 straight victories. The Stags, 52-10 under Holmes, will play Buhler (11-1) for the state title Saturday at Hummer Sports Park in Topeka. Start time is 1 p.m.
Miege is 36-2 in the last three seasons with both losses to Blue Valley, which has made back-to-back appearances in the Class 6A state title game. Junior quarterback Carter Putz, in his second season under center and a Notre Dame baseball commit, has completed 153 of 211 passes for 2,907 yards with 45 scores against three interceptions. He is within range of the 11-man state record of single season passing TDs of 49 set by Northern Heights’ D.J. Bronson in 2010, according to the Kansas Sports Hall of Fame. Senior Landry Weber is an outstanding two-way player with 52 catches for 1,110 yards and 19 receiving scores, while Armstrong has exceeded 1,000 receiving yards for the third straight season. He has 46 catches for 1,055 yards and 18 touchdowns. Armstrong recently tied the state record with 42 career touchdown receptions, according to the Kansas Sports Hall of Fame records. Senior lineman Colin Grunhard, son of Tim Grunhard, will start his 50th career game Saturday. He’s played all three offensive line positions this fall. Junior Jack Burns is dominant up front at tackle. The defense has allowed just 10.2 points per contest, the top scoring defense in Holmes’ coaching tenure. Holmes labeled the defense “top to bottom” the best he’s had. Last week, Miege held Basehor-Linwood to just 106 total yards in a 52-0 victory. “We were hoping to just kind of slow them down a little bit, but as the game went on, the defense just really stepped up and kept making plays,” Holmes said. Buhler won the 4A title in ’13 and has again retooled under veteran coach Steve Warner. He has reached the second state title game in a career that has featured 230 victories and covered 32 years. Buhler had to replace multiple standouts, including quarterback Jace Williams and running back Dillon Engelland but workhorse junior Dalton Brown has emerged behind a revamped offensive line. The defense has played an exceptional level in the second half of the fall. Brown has rushed for around 1,900 yards and has 22 scores. Warner labeled senior quarterback Ethan White “tremendous.” He has accounted for more than 1,600 total yards with 15 passing scores. Warner wants to control the clock behind Brown. The offensive line returned just two players with starting experience in senior guard Austin Bickel and senior tackle Jake Burkhart. Junior center Logan Sweet took over after Sam Cox was lost with an injury. Burkhart shifted after he started at center last fall. Still, the Crusaders have continued their longtime smash-mouth style behind a feature running back. Four juniors, guard Lawson Schultz, tackle Braden Rose and ends Cade McLean and Brendan Webb round out the line. The defensive backs have improved, while junior defensive ends Webb and Rose helped hold Maize South to 103 total yards. After a 45-21 Week 3 loss to Collegiate, Buhler delivered a regular season win versus Maize South, a district victory against Andale and then playoff wins against Mulvane and Maize South. In those four contests, the Buhler defense permitted 12 points a game. When those teams didn’t play the Crusaders, they averaged more than 40 points a contest. 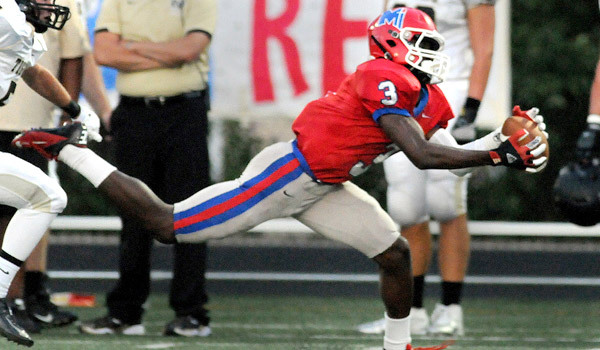 Miege has delivered another dominant season behind a heavy non-senior team and multiple first-year senior starters. Weber, who didn’t have a catch and primarily played defense in ’15, is used in all three phases. Holmes believed he was going to help in slot and play running back. However, Armstrong received the bulk of attention early in the season and Weber, in the slot, was open often down the middle. “We knew he was going to have a great year, but to be able to be one of the top receivers in the state and one of the better players in the metro, it didn’t surprise us, just because we saw the way he worked and everything like that in the offseason, he really wanted to make a difference,” Holmes said. Junior Joe Watskey leads the defense with 93 tackles, 14 for loss. Four of the top six tacklers are non-seniors. Senior end Joseph Gleason and Weber are the lone two-way starters. He has seven TFLs and six receptions. Gleason, the catalyst of the defensive line, is the lone defensive lineman who had started a game before this season. Senior defensive back Djimon Colbert, an Iowa commit, has two interceptions. In the Blue Valley game, he had two tackles and a pair of pass breakups. Since then, teams have not often thrown the ball. Against Basehor-Linwood, he delivered several big plays in the run game on the edge. John Ryan, a first-year senior starter at outside linebacker, has 35 tackles and sets the defense. As well, Danny Wallace, another first-year senior, switched from linebacker to defensive tackle and has five sacks.